Oh, I had a bit of fun with this card for The Rubber Cafe featuring the Farm Fresh Creative Cafe Kit. 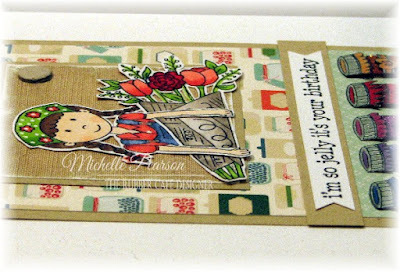 I combined the girl image with the bouquet image...it is a great way to stretch the images in your stamp sets by combining them! 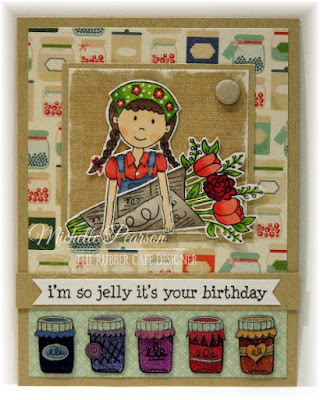 For this card, I stamped the row of jelly jars 3 times: once on acetate, once on white cardstock and once on the blue designer paper. I glittered the backside of all of the jars with the the red glitter included in the kit as well as Lilac Purple, Purple Rocks, Copper and Canadian Blue and let them dry. I colored the the jar labels and lids with a coordinating combination of Copic Markers and a silver gel pen. I cut out the jar lids and labels and attached them to the dried glittered jars as shown. Finally, I attached the glittered jars to the 3 7/8 x 1 inch strip of blue cardstock. In this close up you can see how I cut around the girl image so that she can hold the flowers instead of the veggie box. I layered her onto a 2 1/2 x 2 3/8 inch piece of linen designer paper. I sanded the edge of the paper before layering it on a 2 7/8 x 2 5/8 inch piece of cardstock. 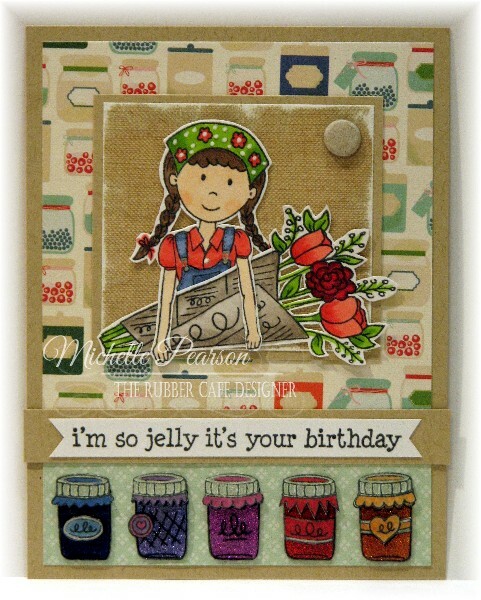 I added a Chip Candi Dot as an embellishment. 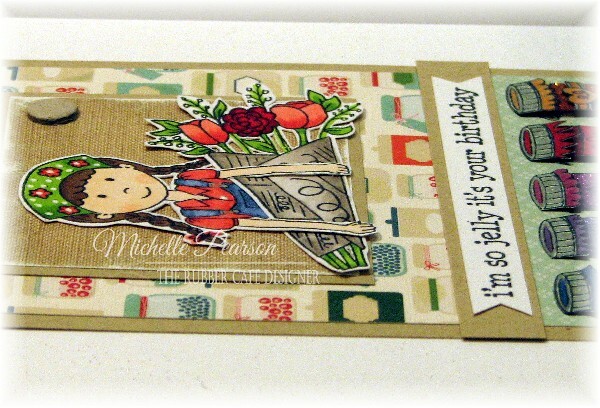 The sentiment is stamped on a 3 7/8 x 3/8 strip of white cardstock. 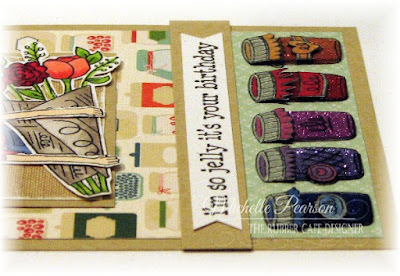 I banner cut the ends and then layered it on a slightly larger strip of cardstock.